Thermistors are thermally-sensitive devices whose electrical resistance varies with temperature. Unlike RTDs and thermocouples, thermistors do not have standards associated with their resistance vs. temperature characteristics or curves. Positive temperature coefficient (PTC) thermistors, where electrical resistance increases as temperature rises. Negative temperature coefficient (NTC) thermistors, where resistance drops in a nonlinear manner with a rise in temperature. To reduce this nonlinearity, multiple thermistor elements are sometimes combined in a single package. Although thermistors are more accurate than some other types of temperature sensors, they have a limited temperature range. Nevertheless, their high outputs and fast response times make them suitable for many temperature-sensing applications. Temperature range, electrical resistance, minimum accuracy, thermal time constant, thermal dissipation constant, and slope are important parameters to specify when selecting thermistors. The thermal time constant is the time required for a 63.2% change in thermistor body over a specific temperature span when measurements are made under zero-power in a thermally-stable environment. The thermal dissipation constant is the power required to raise the thermistor’s body temperature by 1° C in a measurement medium. Factors that affect the thermal time constant and thermal dissipation constant include the device’s mass or thermal mass, the mounting style, and thermal dynamics of the measurement environment. Slope or resistance ratio, another important product specification for thermistors, is defined as the ratio of resistance at one temperature to the resistance at a second and higher temperature. Typically, the first temperature is 0° C and the second temperature is 70° C.
Product specifications for thermistors include coating material, package type, and lead style. Most thermistor coatings are made from a mixture of metals and metal-oxides. Choices may include ceramic, epoxy, glass, and phenolic materials. Bare thermistors are also available. Epoxy coatings are used in lower temperature applications. Glass coatings are designed for higher temperature environments. 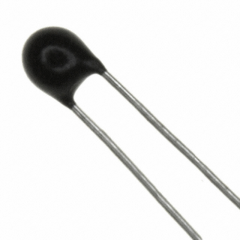 There are two main package types for thermistors: bead and chip. Bead thermistors include disk or rod-shaped devices. Chip thermistors are designed for wire-bonding applications in hybrid circuitry. Leaded thermistors have either radial or axial leads. Radial leads extend from one end or side of the chip package. Axial leads also extend from the package’s side or end, but along the main axis. 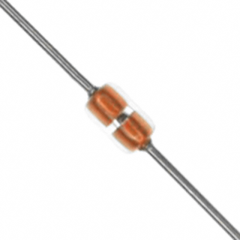 Leadless thermistors are also available.